Yokohama Tire Corporation (YTC) is Baja bound. 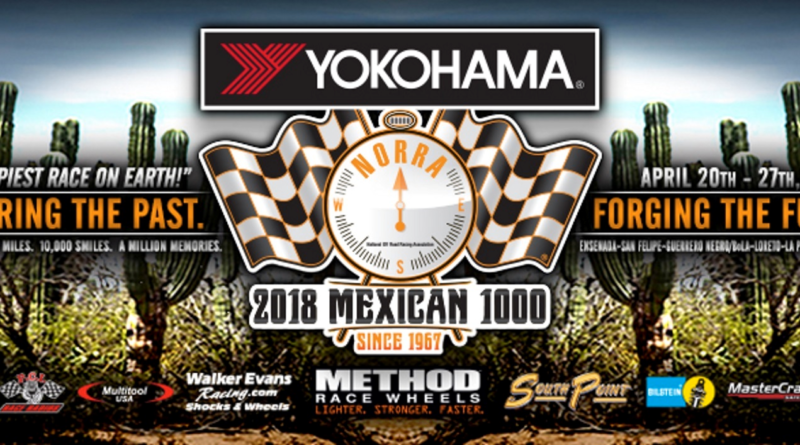 YTC announced it has fortified its off-road racing ties as the title sponsor of the 2018 Yokohama National Off-Road Racing Association’s (NORRA) Mexican 1000. Dubbed “The happiest race on Earth,” the Mexican 1000 is a five-day, 1,300-mile blast through Mexico’s Baja peninsula. The 51^st running of the iconic rally begins April 22, 2018 in Ensenada, with pre-event activities starting on April 20. Niknam said Yokohama will highlight its GEOLANDAR^® tire line at the Mexican 1000, including the GEOLANDAR M/T G003^™ mud-terrain tire. Yokohama Tire Corporation is the North American manufacturing and marketing arm of Tokyo, Japan-based The Yokohama Rubber Co., Ltd., a global manufacturing and sales company of premium tires that’s celebrating its 100^th anniversary in 2017. Servicing an extensive sales network throughout the U.S., Yokohama Tire Corporation is a leader in technology and innovation. The company’s complete product line includes tires for high-performance, light truck, passenger car, commercial truck and bus, and off-the-road mining and construction applications. For more information on Yokohama’s broad product line, visit www.yokohamatire.com (http://www.yokohamatire.com) . Yokohama is a strong supporter of the tire care and safety guidelines established by the U.S. Tire Manufacturers Association and the National Highway Transportation and Safety Administration. Details can be found at the “Tire Care & Safety” section at www.yokohamatire.com (http://www.yokohamatire.com/) .